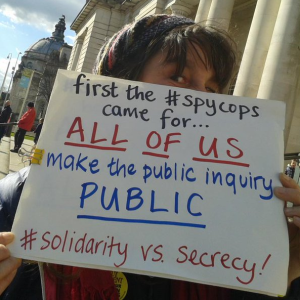 In advance of next week’s crucial hearing, over how ‘public’ the public inquiry into undercover policing will be, a joint submission by the non-police non-state Core Participants – that is, by people who know they suffered damage by the undercover units – has gone live on the Public Inquiry website (as submitted on 11 March). Earlier today, we published a digest of the police’s blanket requests for secrecy – requests which, shockingly, had been backed up by the Home Office. This new submission can now be read in conjunction with that summary. In contrast to the police and state’s bids for presumption in favour of secrecy, the new submission argues for “the primary position of open justice”, and argues that any individual “application for a restriction order must … be approached” from that standpoint, and “be fully justified”. In other words, any instance where secrecy would be appropriate must be dealt with and argued on its own specific merits, each circumstance should be thoroughly hashed out out as it comes up within the course of the inquiry – whereas blanket secrecy at the outset of the inquiry (as the police are asking for) would be overkill, a fatal blow to the core purpose of the inquiry. At 43 pages long to the police and state’s 70, the ‘open justice’ submission may look lighter, but the weight of what is at stake cannot be underestimated. We’ll post further updates and digests as soon as we’re able. In the meantime, please share a solidarity photo, spread the word about the hearing and the demo, and consider writing to your MP to complain about the Home Office position.